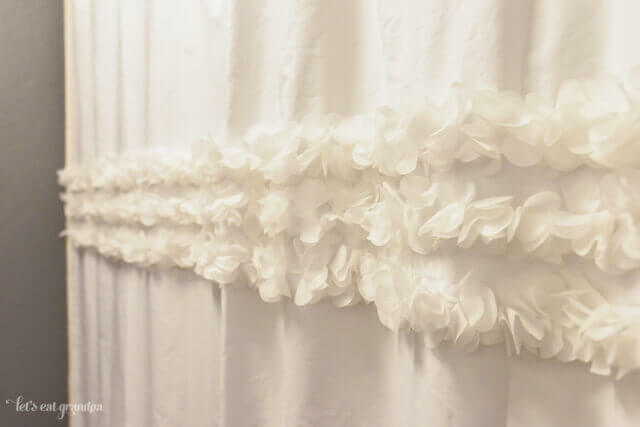 How to make a custom shower curtain using a flat sheet and an old shower curtain as a template — then embellish as desired! This is a really easy project if you can sew a straight line. And it can be customized however you like — the kinds of trims that exist are practically endless — flowers, sequins, giant ric-rac, and pom poms are just the beginning. You are going to use a standard shower curtain as a template for this project. I used the one I was replacing. It didn’t match our new decor, and once I took it down and looked at it closely, I realized it was getting super grimy. Gross! Start by laying your flat sheet out on the floor and placing your slower curtain on top of it. The wider “top” hem of your sheet will end up as the bottom hem of your shower curtain, so place the shower curtain so its bottom hem is aligned with the wider hem of the sheet. (You can sort of see this in the below photo — that wider hem is at the top of the frame and the bottom of the shower curtain is aligned with it.) You can also align with one side, so you only have to re-hem the other side and the top. You then want to trim off the excess sheet and re-hem the edges. To calculate how much sheet to trim off, use a large ruler to measure how much extra sheet you have. Trim that much off, MINUS 1.5″ for the sides and 3″ for the top. You will use this extra fabric for the hem. The side hem of my shower curtain was .75″ wide and my top hem was 1.5″ wide. That’s why I made sure to leave 1.5″ and 3″ of fabric, so I could fold under twice and hem. Once you have cut off the edges, fold under twice and hem. 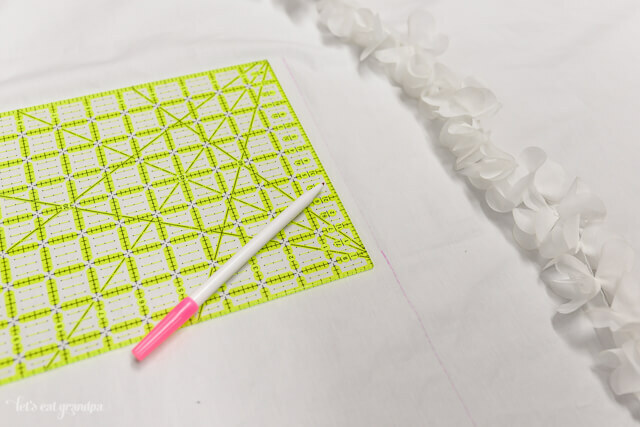 If you haven’t used your buttonhole attachment before, make sure to give it a shot before attempting it on your pristine sheet. Your sewing machine manual should have all the instructions for making a buttonhole. 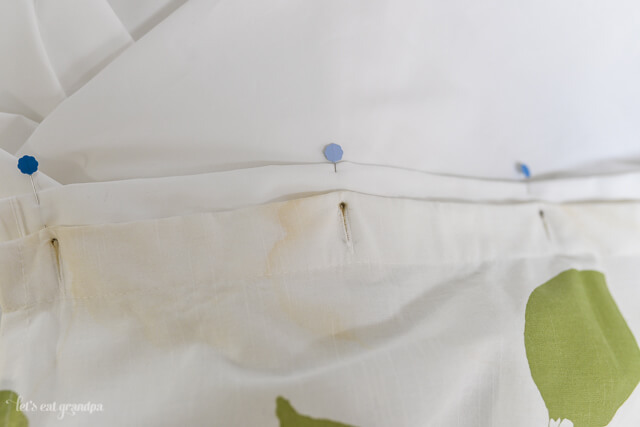 I used a 1″ button for my holes, which was more than enough to slip the shower curtain hooks through. This part definitely took the longest, only because making a buttonhole is not the quickest thing on my machine. Once you’re finished with your holes, lay your sheet back on the floor. You’ll want to draw a line using disappearing ink so you know where to attach your trim and so it’s straight! I attached mine starting 24″ from the top of the shower curtain. I drew one line across the width of my curtain, sewed on the line of trim, drew my second line 2″ below that, etc. Once you have your line drawn, sew on your trim. The trim I used had a mesh backing for attaching — it took a bit of finagling not to sew over the flowers themselves, but I just went slowly and it wasn’t too hard. I probably could have even hot-glued it! And that’s it! It takes a while to make, just because it’s a large project, but as far as skills go, you don’t need to be a sewing expert. Guest Bedroom Makeover for Just $200! Thiss is very fascinating, You are a very skilled blogger. out there hat I’m totally overwhelmed .. Any suggestions?